Empiricism is a term in philosophy for a set of philosophical positions that emphasize the role of experience. The category of experience may include all contents of consciousness or it may be restricted to the data of the senses only . Empiricism contrasts with rationalist philosophical positions that emphasize the role of innate ideas, or a priori knowledge. Kant and others sought to integrate empiricism with rationalism, conceiving that knowledge is constituted by the collation of preexisting concepts within the mind and information gained through the senses. In the philosophy of science, empiricism refers to an emphasis on those aspects of scientific knowledge that are closely related to experience, especially as formed through deliberate experimental arrangements. It is generally taken as a fundamental requirement of the scientific method that all hypotheses and theories must be tested against observations of the natural world, rather than relying on intuition or revelation. Hence, science is considered to be methodologically empirical in nature. The term empiricism has a dual etymology. It comes from the Ancient Greek word εμπειρισμός, the Latin translation of which is experientia, from which we derive the word experience. It also derives from a more specific classical Greek and Roman usage of empiric, referring to a physician whose skill derives from practical experience as opposed to instruction in theory . Originally, "empirical" was used by the skeptic Sextus Empiricus to refer to those ancient Greek practitioners of medicine who rejected adherence to the dogmatic doctrines of the day, preferring instead to rely on the observation of phenomena as perceived in experience . The doctrine of empiricism was first explicitly formulated by British philosopher John Locke in the 17th century. Locke argued that the mind is a tabula rasa ("clean slate" or "blank tablet") on which experiences leave their marks. Such empiricism denies that humans have innate ideas or that anything is knowable without reference to experience. It is worth remembering that empiricism does not hold that we have empirical knowledge automatically. Rather, according to the empiricist view, for any knowledge to be properly inferred or deduced, it is to be gained ultimately from one's sense-based experience. As a historical matter, philosophical empiricism is commonly contrasted with the philosophical school of thought known as "continental rationalism" which, in very broad terms, asserts that much knowledge is attributable to reason independently of the senses. However, this contrast is today considered to be an oversimplification of the issues involved, because the main continental rationalists (Descartes, Spinoza and Leibniz) were also advocates of the empirical "scientific method" of their day. Furthermore, Locke, for his part, held that some knowledge (e.g. knowledge of God's existence) could be arrived at through intuition and reasoning alone. Some important philosophers commonly associated with empiricism include Aristotle, Thomas Aquinas, Francis Bacon, Thomas Hobbes, John Locke, George Berkeley, David Hume, and John Stuart Mill. More recently, the positivists such as Mach, the members of the Vienna Circle and the Logical Positivists, and most adherents of analytic philosophy have been empiricists. A central concept in science and the scientific method is that all evidence must be empirical, or empirically based, that is, dependent on evidence that is observable by the senses or extensions of the senses. It is differentiated from the philosophic usage of empiricism by the use of the adjective "empirical" or the adverb "empirically." Empirical is used in conjunction with both the natural and social sciences, and refers to the use of working hypotheses that are testable using observation or experiment. In this sense of the word, scientific statements are subject to and derived from our experiences or observations. In a second sense "empirical" in science may be synonymous with "experimental." In this sense, an empirical result is an experimental observation. The term semi-empirical is sometimes used to describe theoretical methods which make use of basic axioms, established scientific laws, and previous experimental results in order to engage in reasoned model building and theoretical inquiry. Francis Bacon, though not the first to advocate inductive reasoning based upon evidence observable by the senses, is considered to be one of the founders of (modern) science. In practice, the English scientists of the seventeenth century used mathematics and their imagination in their research. Using the imagination meant keeping all possibilities open, including that the occult or magic (paranormal) could be possible. For Bacon and other early scientists such as Isaac Newton it was important to carefully study nature and the occult. Both Bacon and Newton were also practitioners of alchemy, an early part-scientific part-occult form of modern chemistry. Early forms of empiricism include the epistemological work of Aristotle, Thomas Aquinas and Roger Bacon, among others. Probably the first empiricists in Western philosophy were the Sophists (c. fifth century B.C.E. ), who rejected the rationalistic speculations about the nature of the world common among other pre-Socratics such as Parmenides, Heraclitus and Pythagoras, in favor of focusing "on such relatively concrete entities as man and society"  . The Sophists invoked skeptical semantic arguments, using examples that could be readily seen and observed by others, to undermine the claims of pure reason. Aristotle stressed the importance of induction based on experience. About a century later, reacting against the deeply rationalistic and highly speculative approach of Plato (427–347 B.C.E. ), Aristotle (384–322 B.C.E.) in his later years placed an increasingly strong emphasis on what is received by the senses, that is, on a posteriori observations. Aristotle applied the term natural philosophy to the task of making sense of the natural world, using what would much later become known as inductive reasoning to arrive at categories and principles based upon sense data. This was in sharp opposition to Plato's theory of forms, which was very heavily dependent on a-priori assumptions. In his "middle" and "late" periods, Aristotle became increasingly dissatisfied with Plato's views, and developed an increasingly strict expectation for more explicit empirical confirmations for all inductions (Posterior Analytics) Aristotle also stated the core empiricist tenet that human knowledge of reality is grounded in sense experience. A generation after Aristotle, both the Stoics and the Epicureans formulated more explicitly empiricist explanations of the formation of ideas and concepts. The Stoics, anticipating Locke by some thousands of years, claimed that the human mind is a clean slate which came to be filled up with ideas by way of the perceptions of the senses. However they also maintained that there were certain "common notions" which are present in the minds of all persons a-priori. The Epicureans held an even more strongly empirical a posteriori view. For them, mental concepts are memory images or copies of previous sense experience, and sensations are invariably good evidence of their causes. They worked out a complex account of how objects produce sense impressions and explained error by positing the disruption of causal "effluences" in transit. Among the medieval Scholastics, Thomas Aquinas derived from Aristotle (De Anima, 3.8) the famous peripatetic axiom: "Nothing is in the intellect which was not first in the senses." Aquinas argued that the existence of God could be proved by reasoning from sense data (De Anima, 3.8). He used a variation on the Aristotelian notion of the "active intellect" which he interpreted as the ability to abstract universal meanings from particular empirical data. Earlier concepts of the existence of "innate ideas" were the subject of debate between the Continental rationalists and the British empiricists in the seventeenth century through the late eighteenth century. John Locke, George Berkeley, and David Hume were the primary exponents of empiricism. Responding to the "continental rationalism" most prominently defended by René Descartes, John Locke (1632-1704), writing in the late 17th century in his An Essay Concerning Human Understanding (1689), proposed a new and ultimately very influential view wherein the only knowledge humans can have is a posteriori, i.e., based upon experience. Locke is famously attributed with saying that the human mind is a tabula rasa, a "blank tablet," in Locke's words "white paper," on which is written the experiences derived from sense impressions as a person's life proceeds. There are two sources of our ideas: sensation and reflection. In both cases, a distinction is made between simple and complex ideas. The former are unanalysable, and are broken down into primary and secondary qualities. Complex ideas are those which combine simple ones and are divided into substances, modes and relations. According to Locke, our knowledge of things is a perception of ideas that are in accordance or discordance with each other, which is very different from the quest for certainty of Descartes. 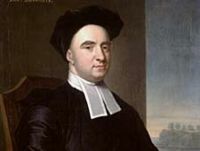 A generation later, the Irish Bishop George Berkeley (1685-1753) determined that Locke's view immediately opened a door that would lead to eventual atheism. 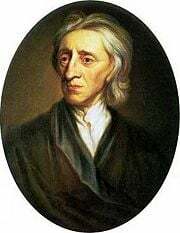 In response to Locke, he put forth in his Treatise Concerning the Principles of Human Knowledge (1710) a different, very extreme form of empiricism in which things only exist either as a result of their being perceived, or by virtue of the fact that they are an entity doing the perceiving. (For Berkeley, God fills in for humans by doing the perceiving whenever humans are not around to do it). In his text Alciphron, Berkeley maintained that any order humans may see in nature is the language or handwriting of God. Berkeley's approach to empiricism would later come to be called subjective idealism. 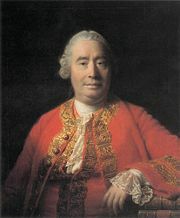 The Scottish philosopher David Hume (1711-1776) added to the empiricist viewpoint an extreme skepticism that he brought to bear against the accumulated arguments and counterarguments of Descartes, Locke and Berkeley, among others. Hume argued in keeping with the empiricist view that all knowledge derives from sense experience. In particular, he divided all of human knowledge into two categories: relations of ideas and matters of fact. Mathematical and logical propositions (e.g., "that the square of the hypotenuse is equal to the square of the two sides") are examples of the first, while propositions involving some contingent observation of the world (e.g., "the sun will rise tomorrow") are examples of the second. All of man's "ideas," in turn, are derived from his "impressions." For Hume, an "impression" corresponds roughly with what we call a sensation. To remember or to imagine such impressions is to have an "idea." Ideas are therefore the faint copies of sensations. Via his skeptical arguments (which became famous for the tenacity of their logic) he maintained that all knowledge, even the most basic beliefs about the natural world, cannot be conclusively established by reason. Rather, he maintained, our beliefs are more a result of accumulated habits, developed in response to accumulated sense experiences. Among his many arguments Hume also added another important slant to the debate about scientific method — that of the problem of induction. Hume argued that it requires inductive reasoning to arrive at the premises for the principle of inductive reasoning, and therefore the justification for inductive reasoning is a circular argument. Among Hume's conclusions regarding the problem of induction is that there is no certainty that the future will resemble the past. Thus, as a simple instance posed by Hume, we cannot know with certainty by inductive reasoning that the sun will continue to rise in the East, but instead come to expect it to do so because it has repeatedly done so in the past. Hume concluded that such things as belief in an external world and belief in the existence of the self were not rationally justifiable. According to Hume these beliefs were to be accepted nonetheless because of their profound basis in instinct and custom. Hume's lasting legacy, however, was the doubt that his skeptical arguments cast on the legitimacy of inductive reasoning, allowing many skeptics who followed to cast similar doubt. Most of Hume's followers have disagreed with his conclusion that belief in an external world is rationally unjustifiable, contending that Hume's own principles implicitly contained the rational justification for such a belief, that is, beyond being content to let the issue rest on human instinct, custom and habit. According to an extreme empiricist theory known as Phenomenalism, anticipated by the arguments of both Hume and George Berkeley, a physical object is a kind of construction out of our experiences. Phenomenalism is the view that physical objects, properties, events (whatever is physical) are reducible to mental objects, properties, events. Ultimately, only mental objects, properties, events, exist — hence the closely related term subjective idealism. By the phenomenalistic line of thinking, to have a visual experience of a real physical thing is to have an experience which belongs to a certain kind of group of experiences. This type of set of experiences possesses a constancy and coherence that is lacking in the set of experiences of which hallucinations, for example, are a part. As John Stuart Mill put it in the mid-nineteenth century, matter is the "permanent possibility of sensation." [Mill] claimed that mathematical truths were merely very highly confirmed generalizations from experience; mathematical inference, generally conceived as deductive [and a priori] in nature, Mill set down as founded on induction. Thus, in Mill's philosophy there was no real place for knowledge based on relations of ideas. In his view logical and mathematical necessity is psychological; we are merely unable to conceive any other possibilities than those which logical and mathematical propositions assert. This is perhaps the most extreme version of empiricism known, but it has not found many defenders. (Macmillan Encyclopedia of Philosophy Vol. 2 (1969), 503). Mill's empiricism thus held that knowledge of any kind is not from direct experience but an inductive inference from direct experience. The problems other philosophers have had with Mill's position center around the following issues: Firstly, Mill's formulation encounters difficulty when it describes what direct experience is by differentiating only between actual and possible sensations. This misses some key discussion concerning conditions under which such "groups of permanent possibilities of sensation" might exist in the first place. Berkeley put God in that gap; the phenomenalists, including Mill, essentially left the question unanswered. In the end, lacking an acknowledgement of an aspect of "reality" that goes beyond mere "possibilities of sensation," such a position leads to a version of subjective idealism. Questions such as how floor beams continue to support a floor while unobserved, how trees continue to grow while unobserved and untouched by human hands, etc, remain unanswered, and perhaps unanswerable in these terms. Secondly, Mill's formulation leaves open the unsettling possibility that the "gap-filling entities are purely possibilities and not actualities at all" (Macmillan Encyclopedia of Philosophy, Vol. 6, (1969), 131). Thirdly, Mill's position, by calling mathematics merely another species of inductive inference, misapprehends mathematics. It fails to fully consider the structure and method of mathematical science, the products of which are arrived at through an internally consistent deductive reasoning|deductive set of procedures which do not, either today or at the time Mill wrote, fall under the agreed meaning of induction. The phenomenalist phase of post-Humean empiricism ended by the 1940s, for by that time it had become obvious that statements about physical things could not be translated into statements about actual and possible sense data. If a physical object statement is to be translatable into a sense-data statement, the former must be at least deducible from the latter. But it came to be realized that there is no finite set of statements about actual and possible sense-data from which we can deduce even a single physical-object statement. Remember that the translating or paraphrasing statement must be couched in terms of normal observers in normal conditions of observation. There is, however, no finite set of statements that are couched in purely sensory terms and which can express the satisfaction of the condition of the presence of a normal observer. According to phenomenalism, to say that a normal observer is present is to make the hypothetical statement that were a doctor to inspect the observer, the observer would appear to the doctor to be normal. But, of course, the doctor himself must be a normal observer. If we are to specify this doctor's normality in sensory terms, we must make reference to a second doctor who, when inspecting the sense organs of the first doctor, would himself have to have the sense data a normal observer has when inspecting the sense organs of a subject who is a normal observer. And if we are to specify in sensory terms that the second doctor is a normal observer, we must refer to a third doctor, and so on. Logical empiricism (aka logical positivism or neopositivism) was an early twentieth century attempt to synthesize the essential ideas of British empiricism (e.g., a strong emphasis on sensory experience as the basis for knowledge) with certain insights from mathematical logic that had been developed by Gottlob Frege and Ludwig Wittgenstein. Some of the key figures in this movement were Otto Neurath, Moritz Schlick and the rest of the Vienna Circle, along with A.J. Ayer, Rudolf Carnap and Hans Reichenbach. The neopositivists subscribed to a notion of philosophy as the conceptual clarification of the methods, insights and discoveries of the sciences. They saw in the logical symbolism elaborated by Frege (d. 1925) and Bertrand Russell (1872-1970) a powerful instrument that could be used to rationally reconstruct all scientific discourse into an ideal, logically perfect, language that would be free of the ambiguities and deformations of natural language, which gave rise to what they saw as metaphysical pseudoproblems and other conceptual confusions. By combining Frege's thesis that all mathematical truths are logical with the early Wittgenstein's idea that all logical truths are mere linguistic tautologies, they arrived at a two-fold classification of all propositions: the analytic (a priori) and the synthetic (a posteriori). On this basis, they formulated a strong principle of demarcation between sentences which have sense and those which do not: the so-called verification principle. Any sentence which is not purely logical or for which there is no method of verification was to be considered devoid of meaning. As a result, most metaphysical, ethical, aesthetic and other traditional philosophical problems came to be considered pseudoproblems. The extreme empiricism of the neopositivists was expressed, at least before the 1930s, in the idea that any genuinely synthetic assertion must be reducible to an ultimate assertion (or set of ultimate assertions) which expresses direct observations or perceptions. In later years, Carnap and Neurath abandoned this sort of phenomenalism in favor of a rational reconstruction of knowledge into the language of an objective spatio-temporal physics. That is, instead of translating sentences about physical objects into sense-data, such sentences were to be translated into so-called protocol sentences, for example, "X at location Y and at time T observes such and such." The central theses of logical positivism (verificationism, the analytic-synthetic distinction, reductionism, etc.) came under sharp attack after World War II by philosophers such as Nelson Goodman, W.V. Quine, Hilary Putnam, Karl Popper, and Richard Rorty. By the late 1960s, it had become evident to most philosophers that the movement had pretty much run its course, though its influence is still significant among contemporary analytic philosophers such as Michael Dummett and other anti-realists. In the late nineteenth century and early twentieth century several forms of pragmatism arose. The ideas of pragmatism in its various forms developed mainly from discussions that took place while Charles Sanders Peirce and William James were both at Harvard in the 1870s. James popularized the term "pragmatism," giving Peirce full credit for its patrimony, but Peirce later demurred from the tangents that the movement was taking, and redubbed what he regarded as the original idea with the name of "pragmaticism." Along with its pragmatic theory of truth, this perspective integrates the basic insights of empirical (experience-based) and rational (concept-based) thinking. Charles Peirce (1839–1914) was highly influential in laying the groundwork for today's empirical scientific method. Although Peirce severely criticized many elements of Descartes' peculiar brand of rationalism, he did not reject rationalism outright. Indeed, he concurred with the main ideas of rationalism, most importantly the idea that rational concepts can be meaningful and the idea that rational concepts necessarily go beyond the data given by empirical observation. 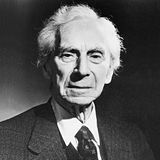 In later years he even emphasized the concept-driven side of the then ongoing debate between strict empiricism and strict rationalism, in part to counterbalance the excesses to which some of his cohorts had taken pragmatism under the "data-driven" strict-empiricist view. Among Peirce's major contributions was to place inductive reasoning and deductive reasoning in a complementary rather than competitive mode, the latter of which had been the primary trend among the educated since David Hume wrote a century before. To this, Peirce added the concept of abductive reasoning. The combined three forms of reasoning serve as a primary conceptual foundation for the empirically based scientific method today. Peirce's approach "presupposes that (1) the objects of knowledge are real things, (2) the characters (properties) of real things do not depend on our perceptions of them, and (3) everyone who has sufficient experience of real things will agree on the truth about them. According to Peirce's doctrine of fallibilism, the conclusions of science are always tentative. The rationality of the scientific method does not depend on the certainty of its conclusions, but on its self-corrective character: by continued application of the method science can detect and correct its own mistakes, and thus eventually lead to the discovery of truth." 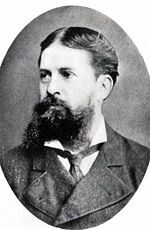 In his Harvard "Lectures on Pragmatism" (1903), Peirce enumerated what he called the "three cotary propositions of pragmatism" (Latin: cos, cotis whetstone), saying that they "put the edge on the maxim of pragmatism." First among these he listed the peripatetic-thomist observation mentioned above, but he further observed that this link between sensory perception and intellectual conception is a two-way street. That is, it can be taken to say that whatever we find in the intellect is also incipiently in the senses. Hence, if theories are theory-laden then so are the senses, and perception itself can be seen as a species of abductive reasoning, its difference being that it is beyond control and hence beyond critique—in a word, incorrigible. This in no way conflicts with the fallibility and revisability of scientific concepts, since it is only the immediate percept in its unique individuality or "thisness"—what the Scholastics called its haecceity—that stands beyond control and correction. Scientific concepts, on the other hand, are general in nature, and transient sensations do in another sense find correction within them. This notion of perception as abduction has received periodic revivals in artificial intelligence and cognitive science research, most recently for instance with the work of Irvin Rock (1983, 1997) on indirect perception. John Dewey (1859-1952) modified James' pragmatism to form a theory known as instrumentalism. The role of sense experience in Dewey's theory is crucial, in that he saw experience as unified totality of things through which everything else is interrelated. Dewey's basic thought, in accordance with empiricism was that reality is determined by past experience. Therefore, humans adapt their past experiences of things to perform experiments upon and test the pragmatic values of such experience. The value of such experience is measured by scientific instruments, and the results of such measurements generate ideas which serve as instruments for future experimentation. Thus, ideas in Dewey's system retain their empiricist flavor in that they are only known a posteriori. ↑ As in discussing most philosophical terms that end in "ism," it is necessary to distinguish heuristic or inclusive variants of empiricism from dogmatic or reductive variants of empiricism. The first says simply that a specific aspect of things is necessary to a competent worldview and is frequently worth concerted attention. The second says more controversially that a specific aspect of things is sufficient to a competent worldview and all other aspects can either be eliminated from consideration or else reduced to the focal aspect. ↑ Plato, it should be noted, actually argued in his dialogue Protagoras that the Sophists were quite un-empirical in their orientation, regarding them as preferring semantics and appearances over unbiased inquiry and substance in their arguments. EB n = Encylopedia Brittanica (1985), vol. n.
MEP n = Macmillan Encyclopedia of Philosophy (1969), vol. n.
SEP = Stanford Encyclopedia of Philosophy (2005). Aristotle, "On the Soul" (De Anima), W.S. Hett (trans. ), 1–203 in Aristotle, Volume 8, (Loeb Classical Library) London, UK: William Heinemann, 1936. Barone, Francesco. Il neopositivismo logico. Rome: Laterza, Roma Bari. 1986. Berlin, Isaiah. The Refutation of Phenomenalism. Isaiah Berlin Virtual Library, 2004. Retrieved May 23, 2008. Chisolm, R. "The Problem of Empiricism," Journal of Philosophy 45 (1948): 512–517. Encyclopedia Britannica, "Empiricism," vol. 4, 480. Macmillan Encyclopedia of Philosophy "Axiomatic Method," vol. 5, 192ff. Macmillan Encyclopedia of Philosophy "Epistemological Discussion," subsections on "A Priori Knowledge" and "Axioms." Macmillan Encyclopedia of Philosophy "Phenomenalism," vol. 6, 131. Macmillan Encyclopedia of Philosophy "Thomas Aquinas," subsection on "Theory of Knowledge," vol. 8, 106–107. Sini, Carlo (2004), "Empirismo" in Gianni Vattimo, et al. (eds. ), Enciclopedia Garzanti della Filosofia. All links retrieved September 7, 2017. This page was last modified on 7 September 2017, at 15:36.